I’ve been in Texas since December 24th, and in terms of weather, it’s been absolutely blissful. Not even the teensiest threat of snow, I tell you! But of course, in true Murphy’s Law fashion, the northeast has had hardly a winter at all, with only one real sticking snowfall so far. But you know, no amount of great weather can make up for the distance between The Brit and me. He’s been flying back and forth whenever he can, but we haven’t been apart this long since our dating days when we saw each other a week at a time every 3 months! I’m in Texas because of a surgery that required extensive recovery. James and I have no family up in New Jersey, so it seemed the safest course to choose a surgeon and a hospital near my family to help with my recovery. Especially since my sister is a nurse – and let me tell you, she has been a Godsend. I am SO grateful she is my sister. Not a day goes by that I don’t think this was the right choice, but it doesn’t help the misery of missing my Brit, and my cats, and my house. This will be the first Valentine’s Day we’ve spent apart in a very long time. I don’t know about y’all, but I think he would murderise me if I sent a bouquet of flowers or somethin’ to his office. Guys seem to be a little sensitive about mushy stuff like that. So instead, I baked. Not only did I bake, I took inspiration from my favorite British blogger, Kathryn at London Bakes. A while back, she made these gorgeous “Celebrations Brownies“. Celebrations are made by the Mars company in the UK, and feature all your favorites Mars chocolate bars in bite-size portions: Milky Way, Snickers, Mars Bars, etc, plus a few that aren’t made here in the U.S., like Bounty, Tropic, and Malteasers. Little known fact: If you find yourself craving a Milky Way bar whilst in the U.K., make sure you purchase a Mars bar instead. In the UK, the names are swapped!. Celebrations are kind of hard to get hold of when you haven’t been cleared to drive yet, so instead, I took my inspiration from the display of Valentine’s Day themed Ghirardelli Squares on display at Target during a sister-approved jail break. I’m a bit particular of the flavors that mix in my brownies, so I chose the Ghirardelli Caramel Trio with milk chocolate caramel, dark chocolate caramel, and caramel latte squares and the Luxe Milk Premium Assortment featuring milk almond, milk hazelnut and milk chocolate squares. Warning: Ghirardelli stuffed brownies are DANGEROUS! Kathryn’s recipe is super fudgey to start with, and the addition of the caramel and nut chocolates makes each bite different and more decadent than the last. You may want to make two pans, just so you don’t have to share. It may be Valentine’s Day, but I swear, there’ve already been a couple of raised voices in my sister’s house over who gets a brownie and when. I’m not naming names, but a certain 5 year old boy may have gotten in trouble more than once for asking every 20 minutes or so whether or not he could have a brownie – starting at 8:05 a.m.! 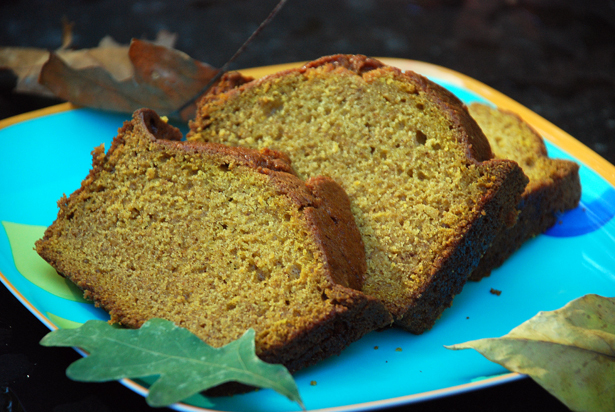 In a large bowl, combine flour, baking powder and kosher salt. Whisk to combine and aerate. In a medium glass bowl, place butter and chocolate chips. Melt in the microwave for about 1 minute (mine took 1 minute and 10 seconds), until butter is completely melted, and when stirred, the chocolate chips melt completely into the butter. Stir gently for 1 to 2 minutes or until chocolate and butter completely combine, and there are no lumps of chocolate chips. If you find that there are, microwave at 10 second intervals and stir after each until the lumps are gone. Add brown sugar to the butter-chocolate mixture and whisk together, making sure the sugar is completely mixed in and there are no clumps throughout. In a separate bowl or cup, whisk eggs and vanilla extract together with a fork, then add to the chocolate mixture. Stir to combine, making sure eggs are completely incorporated. Pour wet mixture into dry, and fold gently with a rubber spatula until flour seems to be mostly incorporated. Do not overmix. Pour half the brownie mixture into an 8×8 square baking pan (I used metal, glass is okay too) sprayed with cooking spray, or greased with butter and sprinkled a little flour or cocoa powder. Unwrap as many Ghirardelli squares as it takes to place them roughly side by side on top of the brownie batter in the pan. I left a little space between each one, maybe 1/4″ inch. 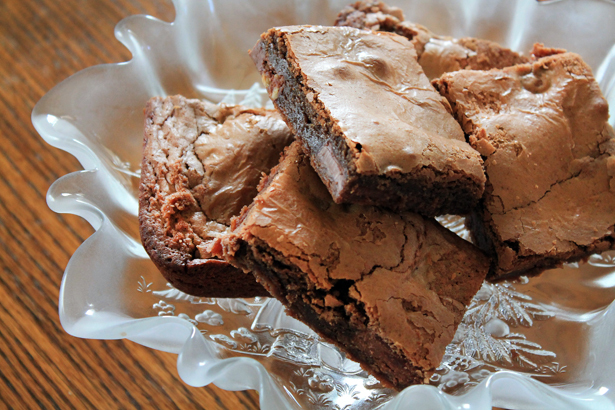 I had 2 bags of Ghirardelli Squares, and was able to make 2 batches of these brownies with 4 squares to spare for snacking. Try to be as random as possible in your Square placement, so that each bite is a little different from the next. That’s part of the fun! Once the batter has been covered by squares evenly, pour the rest of the batter over the squares and spread to cover completely using a rubber spatula. Bake for 20-22 minutes or until the top looks set and the brownies are a little (to use Kathryn’s words) squidgy when touched. Allow to cool completely, then remove from pan and slice into squares. Ghirardelli stuffed brownies are amazing after they cool, but the flavors really develop the next day, so make them one day ahead if you can. Disclaimer: This is not a sponsored post, nor is Ghirardelli even aware I exist. I just love their chocolate squares, and so does my husband, thus the perfect Valentine’s day treat. Amber, I hope you’re feeling more better! 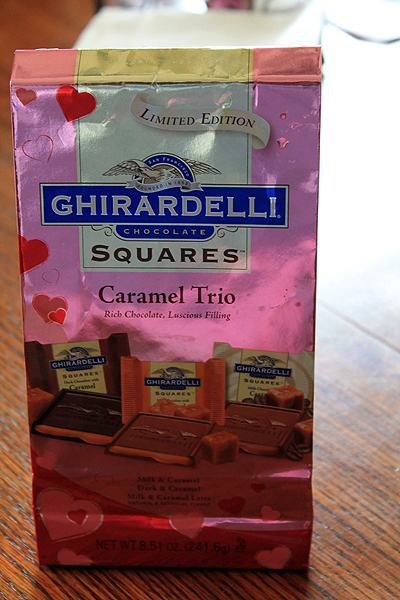 I’m equally in love with Ghirardelli squares. Especially the dark chocolate caramel. I’ve been baking their mint-filled bars inside our On the Fence Brownies and topping them with crushed candy canes for years. I knew we were baking soul mates the moment I met you! Wow, Susan, what a great idea! I’m surprised I didn’t clock that on the KAF site before. I will have to try that, because chocolate + mint is one of my favorite flavor combos ever. Oh my gosh these look AMAZING! Hope you’re recovering well from your surgery! These look so lovely! And, I laughed out loud about your sister-approved jail break. It sounds like she is being the perfect sis – making sure you get your rest, but that you don’t go crazy being cooped up all the time, either! Hope you continue to have a speedy recovery!! She’s being really wonderful. They all are. The kids are especially caring. Hugging my arms and legs because they know I’m not allowed to hug outright. So far I haven’t gone too crazy – I think having worked from home helps a lot! These look wonderful! I love Ghirardelli chocolate. So, I totally made a special trip to Target to locate that package of Ghirardelli chocolates, unfortunately they were not in stock. 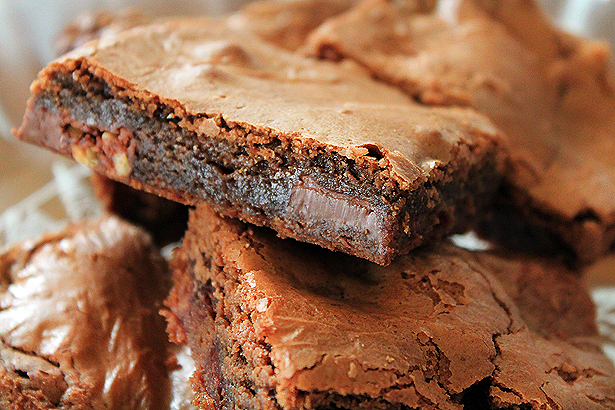 These brownies look absolutely amazing and the first photo is GORGEOUS! Not in stock of ANY Ghirardelli? Holy Valentine’s Day, Batman! You’ll have to pick some up as soon as you can, because you need these in your life, Jamie. And Brian just might not spike your Coke if you give him some! Your brownies look absolutely incredible – the top is so beautifully shiny and cracked and the middle all fudgy and delicious. Wow. I’m a big fan of London Bakes too – so pleased to have discovered your blog! These need to be in my belly!! Loooove this idea! Thanks, Christine. I know I’m incredibly lucky to have my family be willing to do this for me. I hope that your surgery goes well, and that your sister is able to come and help. There’s no doubt in my mind that my recovery has gone better because of my sister’s care, nurse or not. Hey, you never know – maybe Ghirardelli has had a secret crush on you for a while and now you’ve gone and called them out on it. 🙂 What an easy way to bring new caramelly flavors to brownies – I can’t wait to make a pan! You’re going to love them, Casey. I’m also thinking the fruity squares with Raspberry and Strawberry would be amazing. Those look like the best brownies ever! I hope you are feeling better and better every day and can get back home to your sweetie soon, oh and your cats too! Um, yeah, they pretty much ARE the best brownies ever! I am definitely feeling better most days. 3 1/2 weeks and counting! Thanks for sharing the recipe early. Glad your recovery is going well. Just remember absence makes the heart grow fonder! You’re welcome, Gigi! Thanks for the well wishes. Looks so sinful. Yum! These will be very popular at your husband’s office. Take care and best wishes. I’m so sorry you needed extensive surgery. I hope whatever it is, the surgery fixed it and that you’ll be good to go soon!! These brownies look amazing. Hugs to you, your hubby & your kitties. That’s definitely a long time to be apart. I’m so sorry to hear about your surgery & long recovery 🙁 I’m glad you’re near family to help out. I hope you’re at least enjoying some Texas food at the minimum. If it helps you feel better, the Mr. & I will be apart for Valentine’s this year too. He’s been gone for 1 week and has another week left on his business trip. Who schedules a business trip during Valentine’s Day? Clearly his boss is a man. Anyway, take care of yourself, Amber. Let us know if you need anything! Kathryn is an absolute doll. Don’t be sorry, the surgery was a good thing and recovery is going very well other than missing the hubs, cats, and my own space. I hope your darling hurries home to you! I’m counting down the days until mine gets back here and we do our road trip back to Jersey.